You have just landed a great job offer, and you are thrilled, but the employer wants you to start earlier or later than would be optimal. Is there a way to change your start date without sending the wrong signal to your prospective employer? What’s the best way to ask to change the time frame for when you start your position? Can you negotiate the start date for a new job? If you’re not able to start on the employer’s preferred date, you don’t want to take a chance on losing a job offer because of your lack of availability. Be careful how you discuss it. Don’t say that you can’t start then. Instead, see if there is any room for negotiation. If you frame your request carefully, you may be able to start on a date that’s a perfect fit for your schedule. Salary isn’t the only thing that’s negotiable in a job offer. Your start date, along with some benefits and perks may be something you can negotiate. Your immediate response to an attractive job offer should always be enthusiasm at the prospect of working for the employer. Start by saying thank you. Your immediate response to an attractive job offer should always be enthusiasm at the prospect of working for the employer, so there is no doubt that you are very pleased to receive their offer. 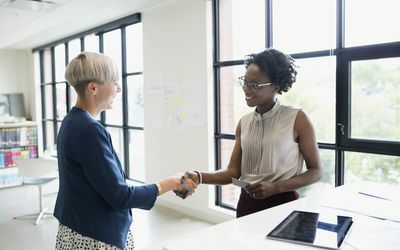 If you accept the job offer first, then discuss a start date, you’ll likely be able to negotiate something that fits both your needs and those of your new employer. If you have an already planned vacation or event that might impact your start date, such as your daughter’s wedding in Jamaica or a family reunion that’s already scheduled, the employer might also be willing to accommodate you. Sometimes making yourself available for some training before your official start can help to bridge a gap. If feasible, perhaps you could use leftover vacation time at your old job to start training for the new one. Even though it may not be an option, it won’t hurt to ask if there is a chance you can start sooner than the date mentioned by the employer. If you don’t ask, you’ll never know if you could have started at a more convenient time. As with all employment negotiations, be ready for some give and take with both your current and prospective employers. For example, if your current employer prefers a month’s notice, you mention that your prospective employer wants you to start in two weeks and try to land on a start date three weeks into the future.